Welcome back my faithful readers. You probably wonder why I didn’t write anything for the past two days. The mid-term holiday has started and I had one of the best weekends ever. On Saturday, I went to the cinema together with a couple of friends. We wanted to see the “Annabelle” movie. This time we agreed to go to a cinema in Dublin. I forgot to look up the cinema address on Google Maps so when I got to the city, I had no clue where to meet my friends. As I was walking past the post office on one of the busiest streets in Dublin, I suddenly see a couple of my friends standing there. What a stroke of luck! Soon after we made our way to the cinema, but first we had to stop at a convenience store to buy some food. The cinema ticket prices are low but the food is overpriced. So it’s better to get your own food in advance. The convenience store had an excellent candy selection and I just couldn’t resist! So I really bought a lot of candy, probably enough for ten people! I also bought my favourite chocolate “Raffaello”. I could eat “Raffaello” every day, it’s so tasty and delicious. As we left the shop it was already quite late and we had to rush to the cinema. We didn’t want to miss the start of the movie! Because “Annabelle” is a horror movie, you can only watch it if you are at least sixteen years of age. In Switzerland, this means that you have to carry an ID with you and the age limit is strictly enforced. In Ireland, they ask you: “Are you all sixteen or older?” and of course we all answer with a hearty “Yes!”. It’s a bit like a gameshow on TV. There’s no need to show an ID. 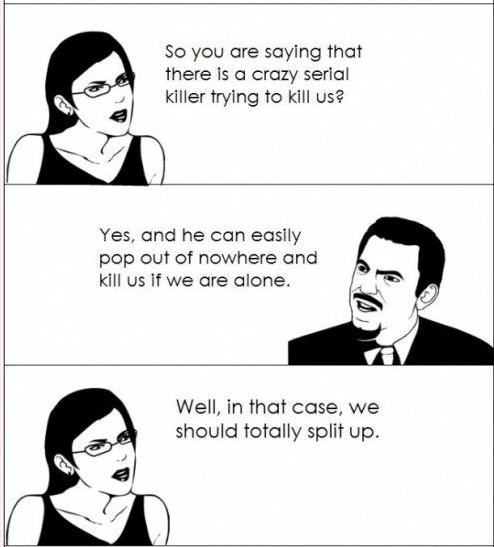 All horror movies follow a basic script. In the beginning, the cast is introduced and we get to know how everyone is connected. This part of the movie is usually a bit boring but it’s important to know the people who get killed! And with “Annabelle” the killing starts soon enough. And there is a lot of killing! My rating for “Annabelle” is eight out of ten stars. There are a couple of really good “jump scares”. Just when you least expect it, something truly horrible and disgusting happens. At one point, I was so surprised that I choked on a piece of “Raffaello” chocolate! I don’t think I will go into the basement for a couple of weeks. On Sunday I went to the “Run for your lives” event. You may have already seen the music video I posted on Saturday. 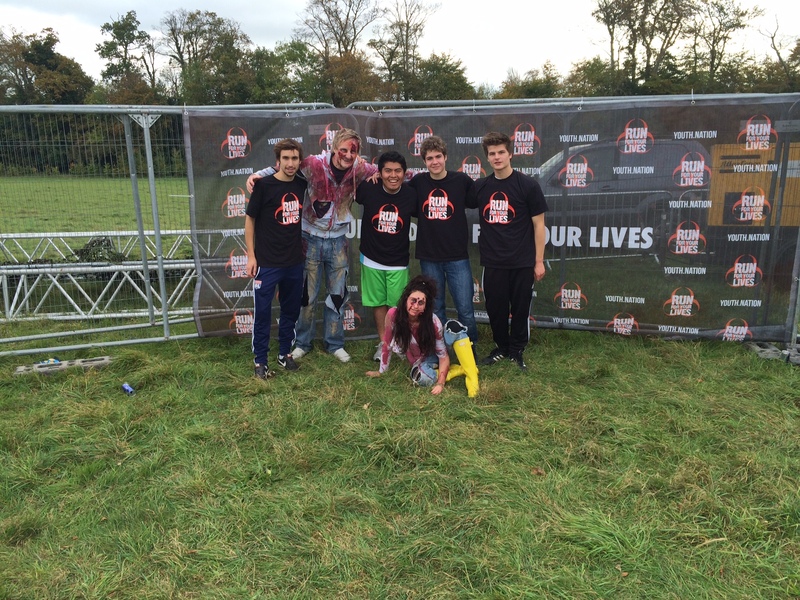 Participants can sign up for one of two roles: You can either be a zombie or a survivor. I picked the survivor role since that way I don’t have to dress up and because I think I can run a lot faster than a zombie. As a survivor you have to wear three red stripes around your hip. The stripes represent your remaining lives. The task of a zombie is to try and grab as many stripes as possible so as to kill the remaining survivors. Survivors need to run as fast as possible along the five kilometre track filled with obstacles. What kind of obstacles? Well, there are pits filled with mud, labyrinths, steep hills and more. While you climb, run, slide along the path, the bloody zombies are always right behind you. Eduardo was there too but he wasn’t fast enough and some nasty zombies grabbed him and dragged him into the forest, never to be seen again……. until much later. “We must never speak of what happened here…”, he said to me but for some reason he still got a T-shirt. Stay tuned for more details in tomorrow’s blog post.